Tom Taylor doesn't live what you'd call a normal life except in comparison to what's in store for him. Tom is the son of author Wilson Taylor, and as such is the supposed inspiration for his father's Harry-Potter-like protagonist Tommy Taylor. Tom was living off his father's still thriving fandom until news broke that brought the son's identity into question. Now not only are the dedicated Taylor fans alternating between worshiping Tom Taylor and wanting his head on a plate, but the magic of Wilson Taylor's fictional world seems to be leaking into Tom's life. Tom's search for the truth about his father is dogged by crazed fans, supernatural killers, and an old conspiracy involving writers, stories, and how both help shape the world. Last year I read Josh Lieb's young adult novel I am a Genius of Unspeakable Evil and I Want to be Your Class President. Early in the book, the comically villainous narrator briefly rants about the importance placed on Ray Bradbury's Fahrenheit 451 and I thought of this after reading The Unwritten. I don't remember any exact quotes, but the basic gist is that maybe people shouldn't put too much stock in writers who write about how terribly important books are. After all, how could writers ever be unbiased about the importance of books? They've got job security to consider. I have a similar knee-jerk reaction when confronted with fiction about fiction, stories, writers, and books. I don't respond to The Unwritten the same way, though. So far it's defied my expectations. 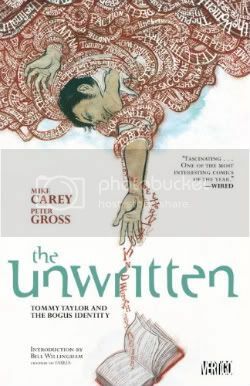 My first suspicion was that The Unwritten was nothing but a build-up to a reveal that Wilson Taylor's fictional world was the real one and the more recognizable world was false; kind of like The Matrix, but instead of a Dystopian future ruled by robots...Hogwart's. But The Unwritten proves more interesting than that. At first it seems to go down the predicted path. Tom is kidnapped by a genuinely super-strong fan claiming to be the Voldemort-like Count Ambrosio and is saved by Lizzie who poses as the Tommy's fictional sidekick Sue. Shortly before a killer attacks the villa where Tom travels to find answers about his father, a tattoo mysteriously appears on his hand: a tattoo just like the one Tom's fictional counterpart sports. Eventually we learn Tom Taylor's troubles are somehow connected to a centuries-old conspiracy. The final chapter of the trade fictionalizes the career of Rudyard Kipling and attributes the writer's tragedies and successes to the same shadowy group causing Tom Taylor so much grief. It's an intriguing story and I'm looking forward to seeing how it unfolds. My single complaint is ridiculously minor. Throughout the volume there are a number of faux Internet pages. They're done better than most. Still, maybe it's just a pet peeve, but faux Internet stuff in comics or prose fiction never works for me. Also, a bit of a tangent - with the exception of the final chapter, each issue opens with a novel excerpt; usually from one of the Tommy Taylor books. The third chapter, however, opens with an excerpt the climax of Mary Shelley's Frankenstein and I enjoyed Carey and Gross's rendering of the monster so much I would love to see them do a full length adaptation. I've been meaning to pick up a trade, and glad to read that most of my hesitations (which were the same ones you had) were unfounded. Agree with you also about the internet pages. Probably the most worrisome aspect of their insertion into a narrative is that it instantly dates the material. I don't worry so much about it being dated. It's just rare that it comes off as genuine to me. It's usually in the form of faux blogs, message boards, chat rooms, and the writers never succeed in suspending my disbelief in regards to the different voices represented. It's a difficult thing to pull off, and I think there are a lot of reasons for that. I don't damn anyone for trying, but I just can't remember an instance when it's actually worked for me. And to be clear, there are only maybe 3 or 4 pages like this in the trade. If I were you, I'd check it out. It's good stuff. Particularly when you consider that $10 for 5 issues worth of material is ridiculously cheap these days (unfortunate as that is).